Perfect hair is what I aim to achieve for all my clients, but health is my top priority. there are many smoothing treatments on the market today, but many of these treatments are not effective and dangerous to the individual heath. after much research I've found and used the most effective and SAFEST professional smoothing treatments in the beauty industry. ​ PROTEIN layer around the hairs shaft to eliminate frizz and smooth the cuticle. -smooth, healthy, frizz-free hair with radiant shine ! - Safe level Formaldehyde ! Are you dreaming of having longer and more voluminous hair. So we offer you the Greatest quality of Human Hair Extensions. Hair extensions can offer versatility that real hair cannot give. 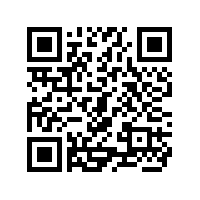 Ask any question about your hair ! We expert in all the Top quality hair straightening treatments and are always keeping up with the Latest techniques for the best chemical hair treatment services in Irvine & Newport Beach salons. We also specialize in the Top quality human hair extensions in Orange County. Achieving The best result for any hair straightening treatments specially Japanese hair straightening & Brazilian keratin hair treatments depends on the training and expertise of the professional hair stylist and the quality of the products! 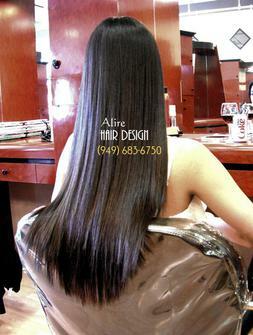 At Alire Hair Design in Orange County, all hair straightening treatments are controlled and done by Al himself, to ensure the best possible results. Al started his hair straightening treatments career after the Yuko system was Introduced in 2002 in Beverly Hills, California. since then he did more than hundreds of popular and theTop quality Hair straightening in Orange County, All with GREAT results in Irvine & Newport Beach salons in California. At Alire hair design the safety of the Japanese hair straightening and Brazilian blowout products are one of our top priorities..
health of our clients comes first. after much research, we are now able to use the best and most effective professional smoothing treatments while maintaining the health of our client hair. Japanese hair straightening System is a revolutionary permanent straightening treatment that works by changing the internal structure of the hair. Once the hair is treated it will retain the shape or texture, that is applied by the flat iron. The Japanese Hair straightening products do not contain any chemicals that produce formaldehyde or other cancer-causing substances and they work on all hair types. This product not only permanently straightens the hair but re-texturize the hair to have a shine, luster and healthy-look, only if done by a "well trained" and "experienced" hair stylist. If you plan on getting your hair colored or treated in any other way it is recommended that you do this two weeks prior to using the Japanese system. The entire Japanese Hair straightening process take up to four to eight hours depending on the type, texture, and length of the hair. Once the treatment has been completed the hair will be permanently straight but new hair growth will be the natural texture. It is recommended to have touch-ups every six to eight months to maintain an even hair texture. This will vary depending on your hair’s natural texture and growth cycle. It is also recommended that the hair be completely blown dry after every time it is washed or wet to maintain the straight texture. For more info about " BEST Permanent Straightening"
Brazilian Blowout Treatment is a super nutrient complex that is a protective protein layer that surrounds the hair shaft to eliminate frizz and smooth the hair cuticle. This creates smooth, shiny, well conditioned hair and is great for repair of dry or damaged hair. The more damaged the hair is the better the process works and the better the end result. 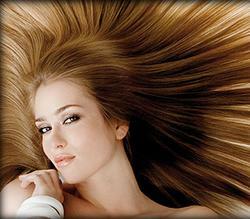 For wavy hair, the Brazilian treatment will make your hair appear naturally straight and healthy. If your hair is curly, then it will create a healthy shiny mane with a relaxed wavy texture. 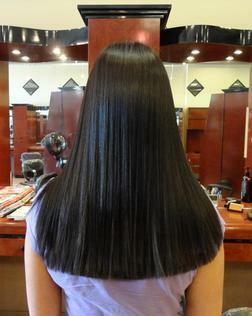 The Brazilian Blowout hair treatment will last for approximately 10-12 weeks with proper care and maintenance. The more you use the treatment the healthier and shiner your hair will become. Has changed the beauty industry - starting with their "signature" Smoothing Therapy and continuing with a complete range of products and styling tools. Since 2007, Keratin Complex has led the way with innovative technology and amazing results. It is no wonder Keratin Complex is now the leading smoothing system in the World! All Keratin Complex treatments and styling products are specially formulated to contain natural keratin protein, which rebuilds, restores and rejuvenates all types of hair. Best Hair salon in Orange County . Copyright 2012: Alire Hair Design | Hair Salon Orange County | All rights reserved. WE WANT YOU BACK !